Last Monday I sat in the room and watched as Maggie went through another OT evaluation. She'd been in OT until this last April, when I pulled her out after being told multiple times that the current therapy place felt like she just didn't need it anymore. I was shocked, as was just about everyone else that worked with her, because while she's very independent and has awesome fine and gross motor skills, she definitely has her share of sensory issues (especially auditory sensory issues). It was the first evaluation that she'd done in a few years. I have to admit, OT and speech are not super high on my list of priorities when it comes to therapies on our schedules. I mean, I take her, week after week, year after year, for that one hour a week, but because of the brief time that she's with those particular therapists she never quite warms up to them (she's in therapy roughly 26 hours a week, so they make up just a tiny part of her schedule). The therapists who work with her every day are a different story. She spends her weekends asking when she'll see them again. She drags me to the door to go to "school" and when I drop her out, if I linger too long, she'll push me to the door and say "Bye, bye" until I get the hint. Still, her speech therapist thought it would be helpful for her to see an OT at the center where she takes speech and there was no wait list this time around (the first time the wait list was a year long) and they could put speech and OT back to back (which honestly at this point was a huge factor) and so I agreed to have her start back up. Paul and I were both able to be there for the evaluation. Maggie's flare for the dramatic made an appearance. There was dancing. There was twirling. And then she reluctantly made an enormous tower of blocks. She protested having to stop twirling, and told her new OT the names of the Bubble Guppies at leat a dozen times, but once she settled in to build she was focused on the task at hand. After that she was supposed to put some blocks in a cup, but instead she stacked them again, one on top of the other. The cup wasn't quite level on the table, so she compensated for it by stacking each block slightly more to the left, so that her tower moved sideways, while staying balanced. I don't think I could have built something that tall and uneven that stayed standing for as long as her tower did. She unbuttoned buttons. She laced a sewing card. She cut two straight lines and did plenty of other things that I had no idea that she could do. On a break she took a few pieces of chalk and drew on the chalk side of an easel, labeling as she drew. "Mermaid. Beach. Water. Sun. Flower." She's done so many amazing things over the years that I know that I shouldn't really be surprised by anything that she does. Still, I find that I am. After the evaluation we accompanied Nani and Grumpa (who the boys have renamed Bopa) to Toys R' Us. Sadie was adamant that there was one thing she wanted for her birthday. A bike. And to learn to ride that bike. As Sadie picked out a purple MLP bike, Maggie and I strolled up and down the aisles. I was thinking about getting her a bike for her birthday too. We strolled past the Princess bikes, and the Finding Dory bikes, and a particularly colorful Rainbow Dash bike. Then she saw it. 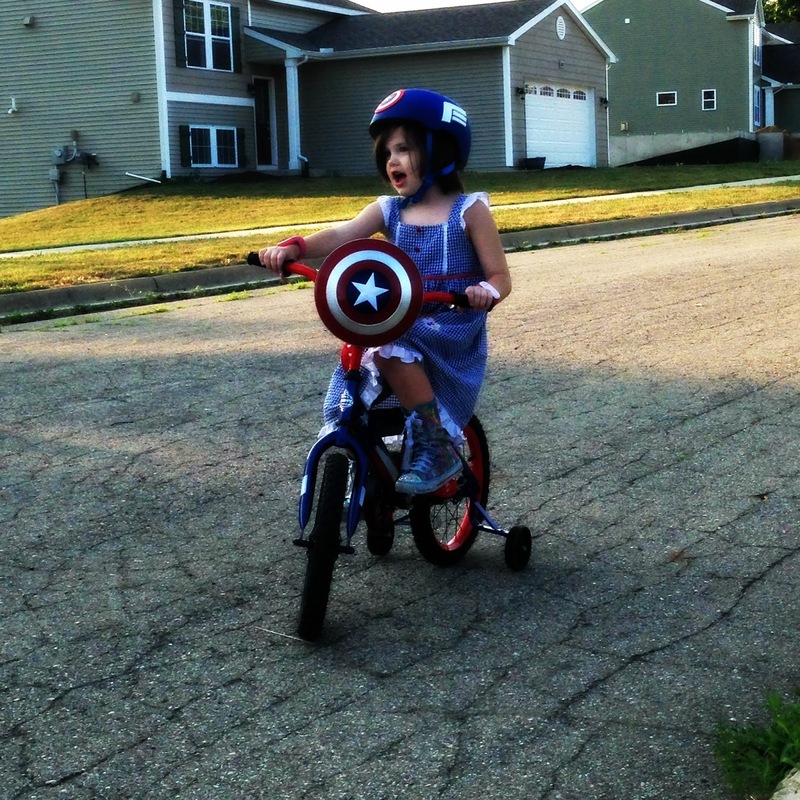 The Captain America bike. And she flung herself sideways in the cart and managed to grab the handlebars and hung on tight. She seldom shows any interest in any toys in toy stores, so I put her down and let her sit on it and helped her ride up and down the aisle. She loved it. 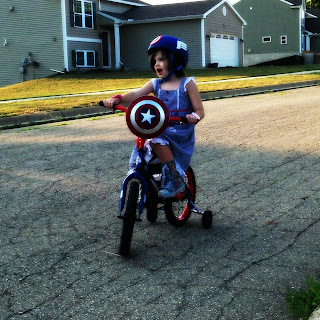 And by the time we left Nani and Bopa had volunteered to add the Captain America bike to their shopping cart. And so it was, on Sadie's birthday that we took all the kids outside, Sadie and Maggie on their new bikes, Patch on a handed down tricycle (while loudly telling us that he needs a bike for his birthday in November), and James sitting in the little red wagon. I shouldn't have been surprised that after five minutes of Paul helping keep her steady she was racing down the street, steering, speeding up and skidding to sudden stops. This is Maggie we're talking about. And in possibly even bigger news, during the half hour the kids were riding bikes before bedtime, she didn't try to elope once, even though there was a huge field nearby and she walked to the edge of it and stared off at it. 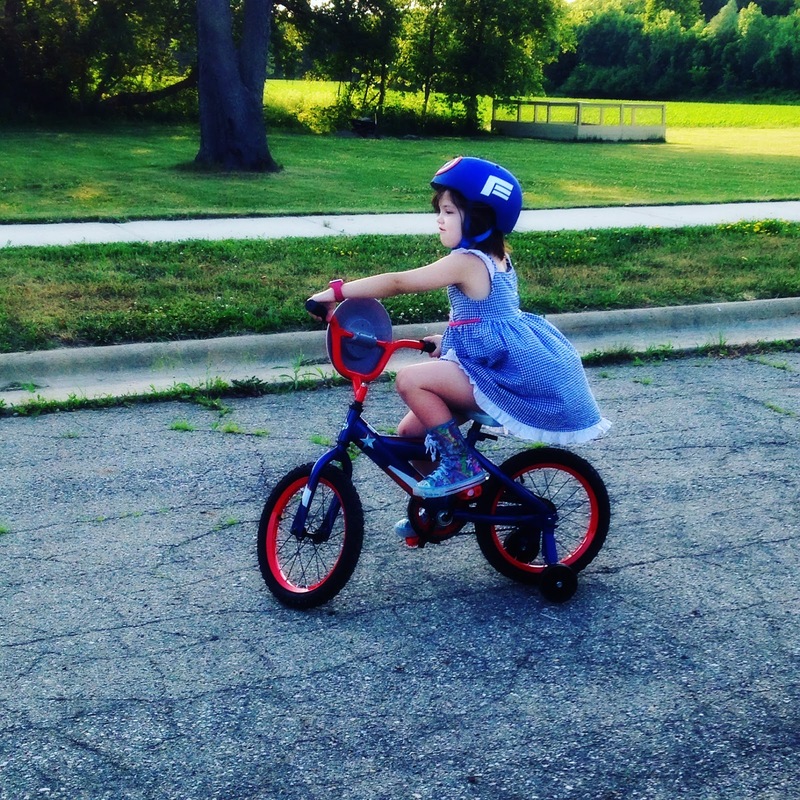 Instead of sprinting into the open space she came back and kept playing with her bike and running around with her brother and sister! I won't be taking of her GPS anytime soon... but... baby steps! This makes me happy. :) Go, Maggie! Yay! 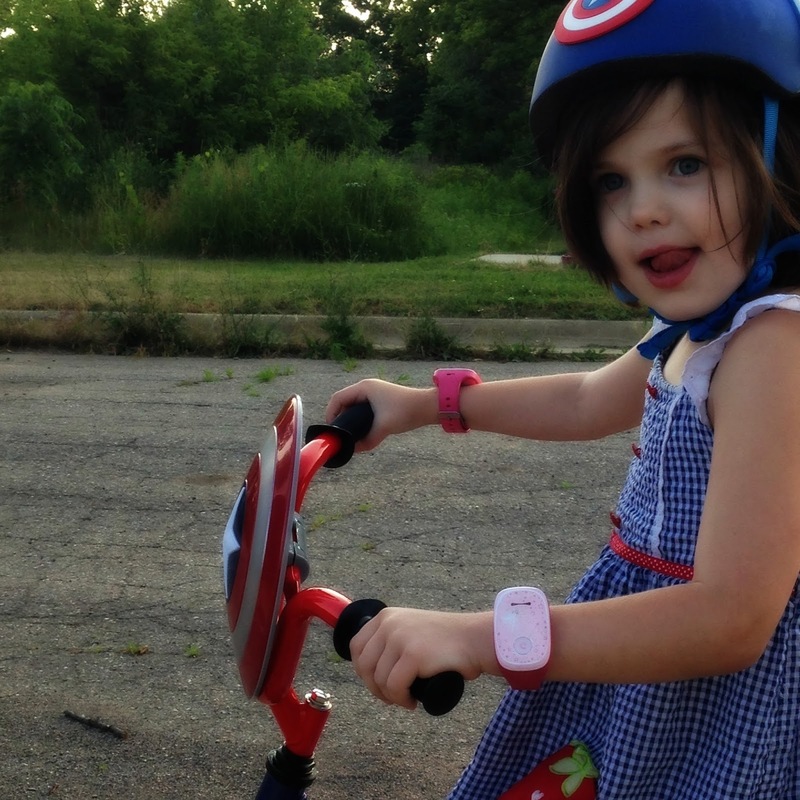 Does Super Girl need training wheels? She seems like she conquers physical features beyond her years all the time, so I was just curious. Yay, bikes!